Muco is the sweetest, most lovable dog in the neighborhood. This sparkly-nosed Shiba Inu lives with her owner and best friend, Komatsu, a glassblower who lives in the mountains. These two companions have wonderful adventures, from going on walks to playing in the pond in front of their house. No matter where they go or what they do, Muco will always love her best friend Komatsu! 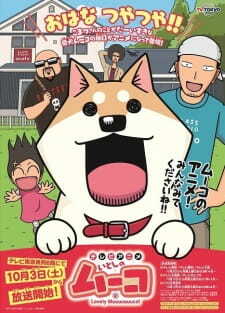 Charming show about a man, his friends and his pet dog Muco. Words cannot describe how this show made me feel. Sure, the animation may be rubbish and it is intended for children but I just can't watch Muco without the dumbest smile on my face. The voice acting is great, Muco is adorable and the soundtrack is suitably upbeat. It helps that every episode is only 12 minutes so it doesn't drag on; not to mention the second ending theme is easily one of the best ending songs from any anime I've seen. The best bit is that when you've finished watching you can go onto the official Muco twitter (She's a real dog) for even more good times. Muco makes me a happy camper and if you don't feel the same then you probably have a heart of ice. Despite the odd art style, this was a very enjoyable anime to watch. This is one of those aniime that are good to watch after a long day when you need something silly and undemanding of your attention and time. All of the characters are likable and each episode is always relatable in some way. Muco is especially adorable and never fails to make you smile with her silly dog antics! If this anime doesn't make you want to hug and spoil your own pet, nothing will! I'd definitely recommend this to anyone looking for something easy going to watch. With each episode only being 12 minutes long, it's easy to find the time to kick back and watch an episode or two. I don't think anyone would be disappointed after watching this. At first Itoshi No Muco might strike you as a strange low-grade anime, but given its lighthearted nature, lovable characters and wacky antics, it'll give you a lot of enjoyment. I haven't read the manga so I'm not sure how well it compares to the original source material, but based off the 25 episode series I can safely say that there's a lot of humour and fun to enjoy, even if there is some repetition. Even though it looks kinda silly and the art style is a bit weird, this anime is good. It's not a masterpiece, but it's entertaining and funny. The episodes are only 12 minutes long, but I don't think they need to be longer. Itoshi no Muco is a silly little anime, and I recommend it if you want something more light-hearted in your life. It doesn't really have a story it's just all over the place, but there are some things that repeat in the episodes. The anime is silly, but I haven't laughed out loud at least yet. And Muco is just adorable.